Guelph Community Sports is the central hub for indoor soccer in Guelph. Founded in 2006, Guelph Community Sports, or “GCS”, provides space for Guelph Soccer players, coaches & families to play and train throughout the winter. 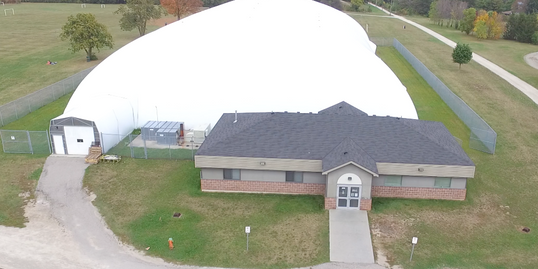 Guelph Community Sports can accommodate soccer, ultimate frisbee, flag football and other indoor turf sports, and also provide space for birthday parties, bubble soccer and more. From a soccer standpoint, the dome is large enough to play 9v9 recreationally or split into two 5v5 halves. If you are interested in renting the facility, please use the form below. It will be forwarded to GCS. Submitting this form does not guarantee your rental, and the above hours may not be reflective of the latest availability. We kindly request that all payments be made via cheque - no credit or debit cards can be accepted. Cheques can be dropped off at the Guelph Soccer office inside the building and should be made out to Guelph Community Sports, not Guelph Soccer. Thank you! Someone will be in touch.